London broil with balsamic honey sauce. Happy 1st day of September!! 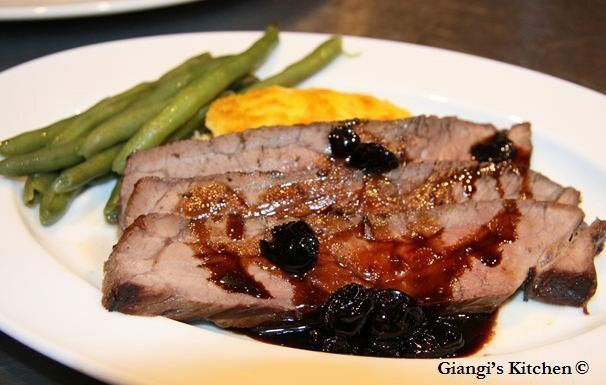 I am honored and thrilled to have one of my favorite recipes, London Broil with Balsamic-Honey Sauce to have been selected as the “ Featured Archive Post for the month of September 2013” on Food Frenzy. Thank you to everyone of you for your love and support. In a large glass cooking pan mix the 2 tablespoons balsamic vinegar, 2 tablespoons honey and olive oil. With a fork poke the London broil and add it the glass pan. Turn to insure the meat is well covered with the mixture. Cover and place in the refrigerator for a couple of hours, occasionally turning the meat. In a small heavy bottom sauce pan add 1 cup balsamic vinegar, 3 tablespoons honey, cranberries and tart cherries. Cook over moderate high heat until reduced by half. When the right consistency is reached, not too thick nor too thin, turn off the heat and add the butter. Mix well. Preheated oven at 375º. In a broiling pan (the one with a top part that has slits and sits over a shallow bottom pan) place the London broil. Cook in the oven for 20 minutes. Turn the oven to broil and broil on both sides for about 5 minutes in each side. Remove from oven, cover and set aside for a couple of minutes. Re-warm the balsamic-vinegar sauce. Slice the meat and serve with the sauce over it.